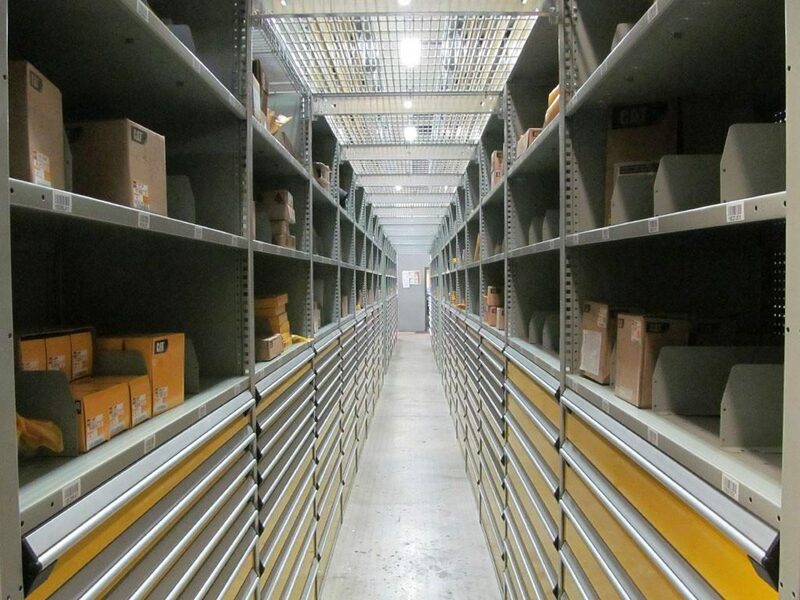 A Rousseau specialist came to the aid of Kelly Tractor, a Caterpillar equipment dealer, and really pushed the boundaries of what a storage system can do. A combination of multi-level shelving and drawers in shelving were used to design the ideal solution for the company: efficient and scalable storage that can grow with the company. The company had too many parts for their available storage space and wanted to increase their storage capacity by 25% to make room for new equipment and parts. All this had to be done without expanding the building and keeping the warehouse operational. Use the various storage products available so that each part number has a specific location, while retaining some of the existing shelving and cabinets and creating 25% extra capacity for future expansion. Like many other companies, Kelly Tractor in Miami, FL, was looking to expand its warehouse capacity substantially without enlarging the building itself. Kelly Tractor’s warehouse was using outdated cabinetry and shelving that was not providing adequate storage. John Sarnecki, manager of the parts department in Miami, described it thus, “We were at the point where we had about 55,000 part numbers but we only had 50,000 locations available.” So, he started looking at the various solutions available. After a few unsuccessful trials with another company, John asked Caterpillar if they could recommend a manufacturer. They recommended Rousseau Metal Inc. He therefore began to work with Dave Shank of Deluxe systems, a Florida-based distributor specializing in Rousseau products. Two main goals needed to be taken into account for this project: each part had to have its own unique storage location, and an extra 25% of storage capacity needed to be provided. Speaking of working with John Sarnecki’s team, Dave Shank said, “They were open-minded. It allowed us to propose a different solution than what they had initially considered.” He subsequently proposed a customized solution combining modular drawers in Spider® Shelving and Rousseau mezzanines. The shelving drawers provided high-density storage while larger parts could be stored on shelves. John explained, “One of the things that most Caterpillar dealers are mostly concerned with is cleanliness. This system enabled us to have a lot of our parts out of open shelving and in the drawers, which improves the need for contamination control.” Furthermore, the addition of a mezzanine and deck-over shelving helped Kelly Tractor to substantially increase its storage and expansion capacity, while retaining some of the cabinets and shelving they already had. Dave indicated that the expansion capacity had even exceeded their initial expectations. This system also allowed the full height of the building to be used. Before Rousseau products were installed, the full height of the building was not being used because objects stored on top of the shelves were only accessible by man lift. A second level helped to maximize storage by using all available space and effectively doubled the square footage being utilized. 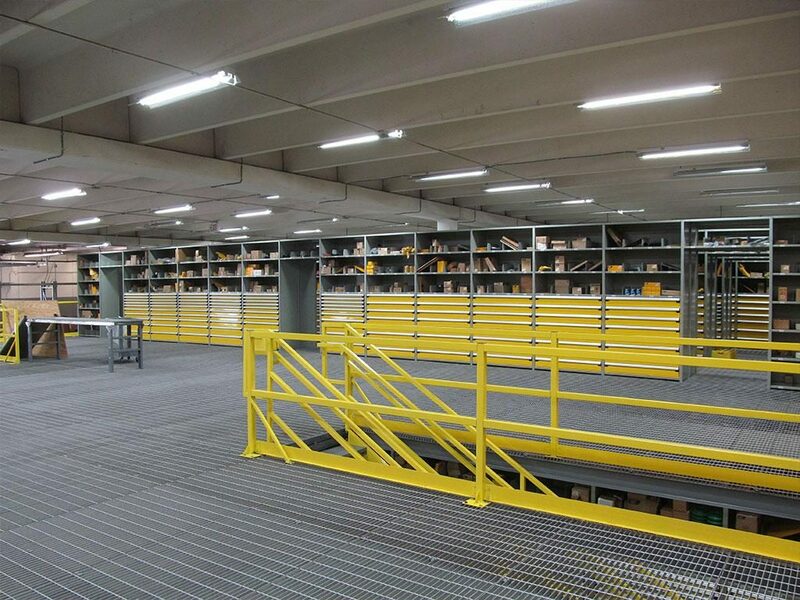 One of the other challenges encountered in this project was the logistics of installing the units. The warehouse had to remain operational and open for the duration of the project. Dave Shank therefore put together a three-phase plan. The timeline was a crucial element of this project. John recalls, “I think the best thing that Rousseau did was when they said they were going to do something, they did it. We were on a very tight schedule because it was a working warehouse. We said that we were going to be needing the first cabinets on June 1st, and on June 1st the cabinets were there.” John added that the Deluxe Systems team was very professional, which meant that the hazards associated with such a project were well managed. In short, Kelly Tractor’s project was a big success. The choice of Rousseau products ensured that every part had its own storage space and the initial expectations for expansion capacity were not only met, but exceeded. There are some items that are difficult to store and retrieve from conventional shelving. The first post in this series concerns items that are HEAVY! This can also include items that are awkward to lift or must be picked up in a certain way to avoid damaging the item (or damaging your back when you lift). There are two basic problems here. Because they are hard to handle, and usually picked less often, these items are often stored on the lower shelves of a shelving system. This creates two problems. First of all, it is harder to store them, as you have to bend over with a heavy or awkward load, pushing or manipulating it into the shelf for storage, you risk injury to your back or knees. The second problem comes when you have to retrieve the item. It has to be dragged out to where you can get a grip on it and then lifted onto a cart or truck or carried away to the location where it is needed. Modular drawers can provide a convenient solution to this problem. You can order modular drawers with adapter brackets that fit into your existing shelving units. 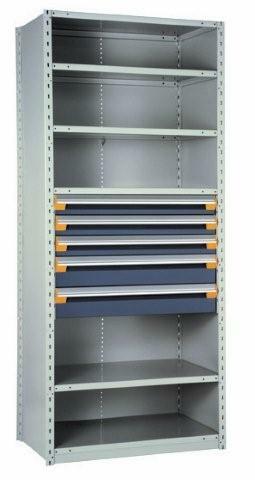 These drawers are available without fronts and sides, essentially creating a pull-out shelf with 400# capacity. This shelf can extend fully out into the aisle creating easy access to whatever is stored on the shelf, whether is a heavy case of product, like oil or fluids; an oddly shaped item, like a set of jack stands; or even a heavy die, that is picked up by an overhead hoist. There are certain restrictions with this type of application. So, contact us if you have specific questions. 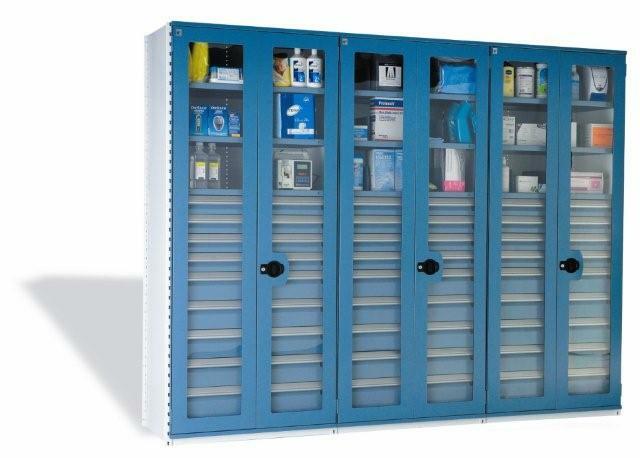 Most companies need to store parts, components, tooling, and repair items in an easily accessible location. This is not too hard to plan for a small plant or building, but with larger facilities, the time to access items from a distant location can become a factor in maintaining an efficient operation. There are two basic options for this type of storage, each with their own benefits. The disadvantage of this layout is primarily time; time to walk from a work area to the storage room and back again; time waiting in line for service; time spent with co-workers along the way. In a larger facility or a busy facility, this can become a significant additional cost. These security options allow control of inventory by certain workers only and eliminate any delays in getting those items to the worksite locations when needed. Quick visual inventory for spot checks is also easy as the drawers open to their full depth making all compartments easily visible. Evaluate your situation and decide which storage plan is best for your business and then consider using modular drawers to maximize your space and increase efficiency in your operation. Yearly inventory counts are always difficult and time consuming, especially with smaller parts. This becomes excessive when, for a variety of reasons, you need to verify stock levels on a more frequent basis; such as quarterly or monthly. However, you can increase space in your stock room and decrease the time it takes to inventory your products using modular drawer systems. Modular drawers provide very efficient storage, creating more space for parts in your shelving units. The drawers have 100% extension, so the full depth of the drawer is visible when fully extended. So, all parts and components, whether in partitioned compartments or in plastic bins, are easily accessible for viewing and counting. This makes inventory counts much faster and easier than working on a conventional shelving unit with plastic bins. You can also take a quick visual inventory at any time without having to pull out each shelf bin and look inside or open up a box and count the contents. 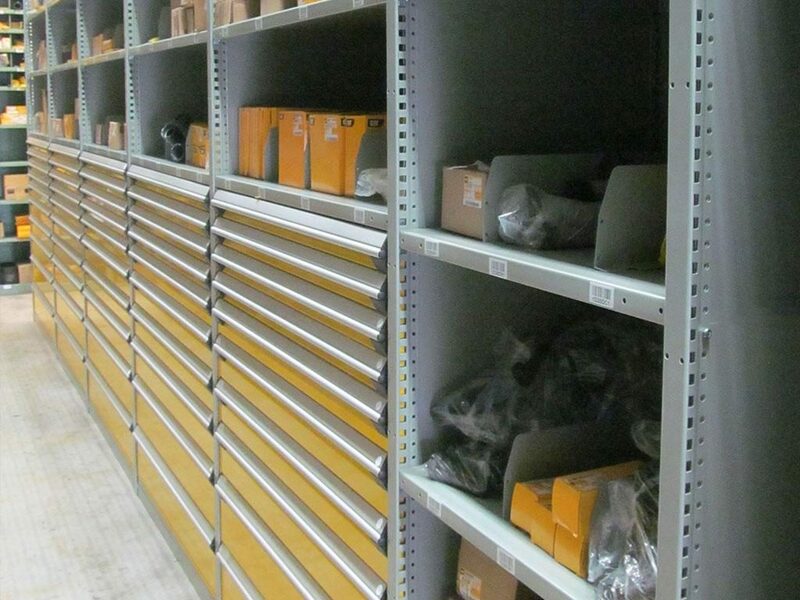 Drawers in shelving also help keep inventory parts and components away from environmental dust and debris, as opposed to shelf bins that leave the contents exposed. 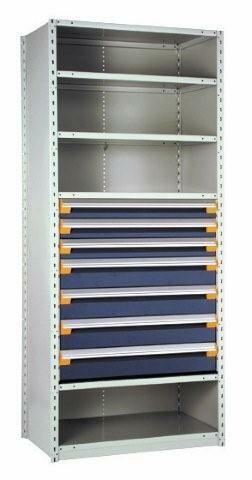 Modular drawer systems can be added to your existing shelving to increase the storage space you have available. The drawers are adaptable to most brands of shelving with specific adapter brackets. You can choose how much space you want to convert to drawers, using brackets from 12” to 48” in height within the shelving unit. The drawers are available to fit most standard shelf sizes and range in height from 3” to 14” high. Drawers can be ordered in a variety of colors. So you can coordinate with existing equipment or mirror your company colors. You can also order drawers in colors to code drawers for certain types of products, making it easier to locate products. And, if you don’t want to integrate drawers into your existing shelving units, all these options are available in stand-alone locking drawer cabinets. For more information or help in designing an efficient drawer storage system conversion for your existing parts room, Contact us at 401-383-0883 or by email at support@innovostorage.com. We all know that Modular Drawers are the most efficient way to store small parts. 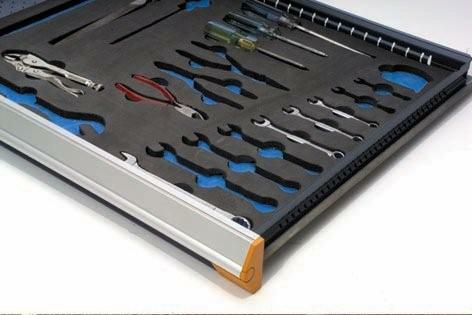 However, you can increase your efficiency by using drawer inserts that complement the parts you need to store. Here are some of the options that are available for Rousseau Modular Drawers. Partitions are the separators that go from front to back in the drawers. They install in slots in the drawers and are held in place with 2 small screws that are easily removed to re-position the partitions. 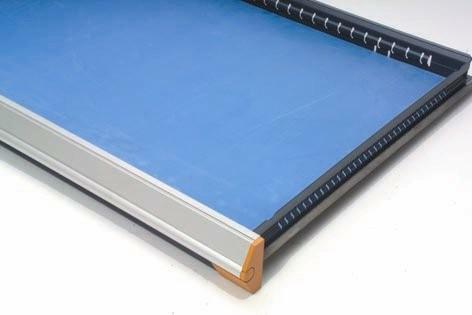 Dividers go left to right, snap into place between the partitions, are adjustable on ½” centers, and can be installed anywhere in the ‘lanes’ created by the partitions. Determine the best width between partitions for your products. 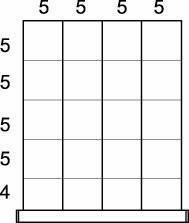 Then choose how many dividers you will want in each lane created by the partitions. We have several standard layouts that are shown on a separate sheet, but we can customize any layout to suit your specific application. The usable space in any compartment is about ½” less than the nominal spacing of the partitions and dividers. Although most Partitions are usually installed from front to back, we do offer partitions that go from left to right in the drawer. 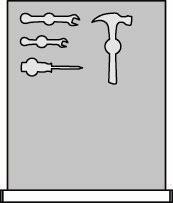 These are useful to separate longer parts or tools that will not fit from front to back in the drawer. Bin Cups are removable plastic bins that are used to store smaller parts and hardware items. Bin Cups come in 4 sizes and 2 heights. The bin sizes are designed for exact fit in all Rousseau drawer widths. The 2” height will fit in a 3” Face drawer and the 3” height fits in a 4” Face drawer. The bin cups have rounded inside corners for easy part retrieval, are easily removed from the drawer and can hang on any standard bin rail system. Bins are also available in conductive material for ESD applications. 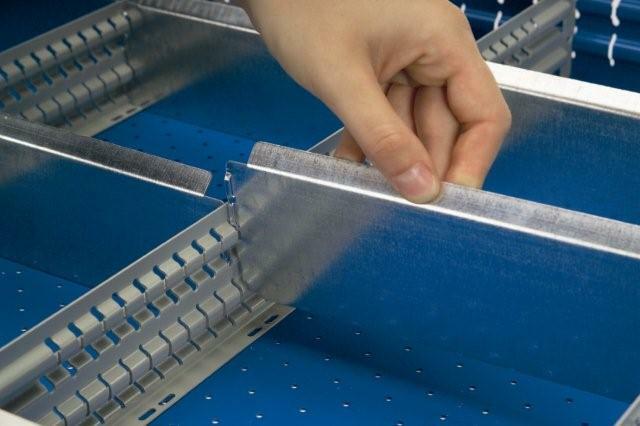 Groove Trays are plastic trays that form channel spaces for storing longer and narrow items such as drill bits, tooling, large sockets, files, etc. 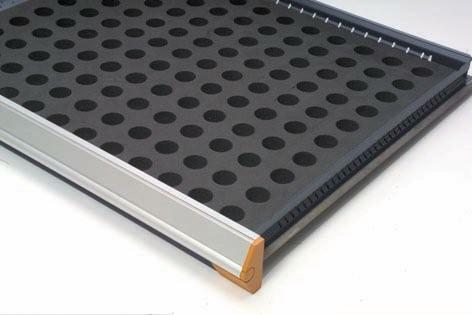 The trays come in sets with 2 to 5 channels that are sized to fit our standard drawer depths. There are three usable channel widths: 1”, 1.5” and 2.5” wide. 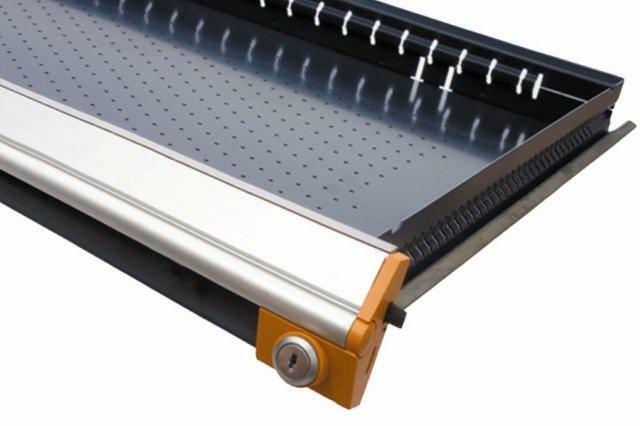 They have adjustable dividers that can snap in place anywhere along the depth of the tray with an angled back for easy to read labeling. 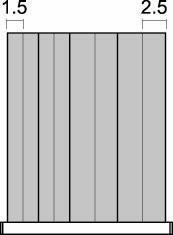 Hanging File Bars are available to store standard hanging files. 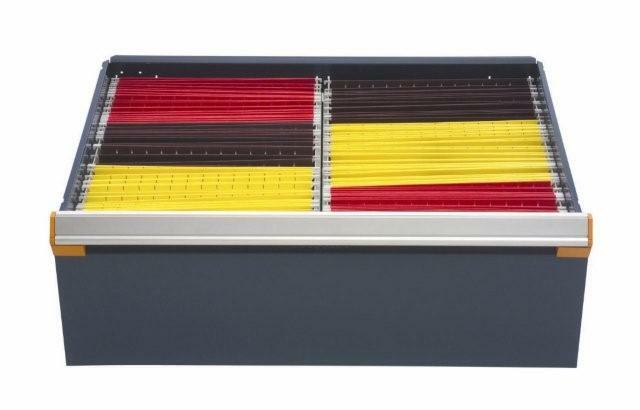 The file bars can be installed for hanging front to back (as shown) in drawers from 18” to 27” deep. Bars are also available for a left to right orientation for drawers from 24” to 48”wide. The drawer must be deep enough to allow for the full height of the files you are hanging. Keep in mind that some drawer sizes will fit the file folders more efficiently than other sizes. 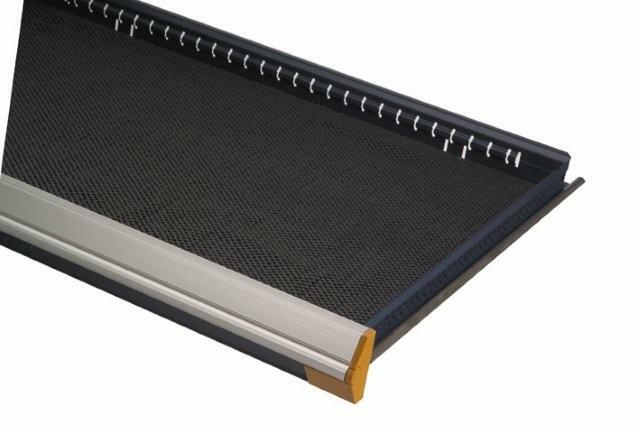 PVC Drawer Liners are a PVC coated mesh fabric that provide a protective and non-skid surface on the bottom of the drawer. 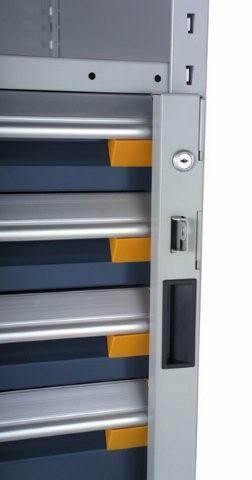 This is the only protection option that can be installed under our partition and divider system. Foam for Protection is a ¼” thick high density foam that protects sensitive items that are set in the drawer. This option cannot be used under partitions and dividers, but can be cut to size and installed in individual partitioned compartments. Foam for Tools is a 2-part product. The base is a ¼” high density blue foam, under a ½” thick self-adhesive black foam. The black foam is cut out to fit the shape of your specific tool set. Then the protective liner is removed and the adhesive back is pressed onto the blue base layer, providing tool slots with contrasting outlines. Foam for Collets is a 1” thick high density black foam that can be cut out or punched to fit the shape of your collets, mills, bores, or parts containers. 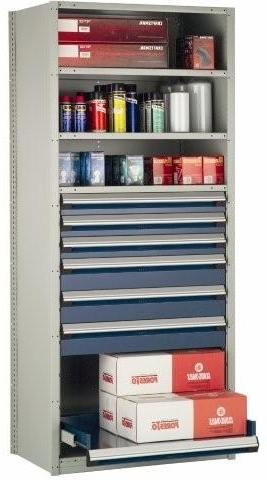 This allows the parts or tools to stand vertically in the drawer, taking a minimum of space, while protecting them from damaging contact with each other. We have product information sheets with suggested layouts for each specific drawer size. However, most of our drawer insert systems are compatible with each other. So, you can mix and match within any individual drawer. You could have partitions and dividers on one side of a drawer with bin cups on the other. Or, you could have groove trays combined with foam for collets or tools. We can assist you to come up with the best insert options for your particular application for small parts or tooling. A Great Option… IF you can find them. Today’s competitive economy demands efficiency of every organization. Evaluating your current capacities, strengths, and weaknesses can lead to creative ideas for improved operations in manufacturing processes, work-in-progress parts storage, maintenance and MRO supply storage, and order picking layouts. Sometimes those ideas will demand consolidation and reorganization of your storage or manufacturing facilities. If you have read any of our previous posts, you will know that we strongly recommend the use of Rousseau drawer cabinets or drawers in shelving systems for greater storage density, faster picking and easier inventory counts. However, although we know that more efficient storage systems have a high return on investment, installing all new drawer storage products can be costly. So, you may want to consider purchasing used or factory surplus drawer storage equipment from a professional equipment dealer to keep your initial costs lower. Choosing used or factory surplus industrial drawers may be a good option for several reasons. First of all, if the exact equipment you need is available, then the lead time can be shorter and you can start your reorganization sooner. The cost will also be lower for used equipment; typically 25% to 40% less than the price of new equipment. One very lucky option would be to find used Rousseau brand modular drawers in good condition. 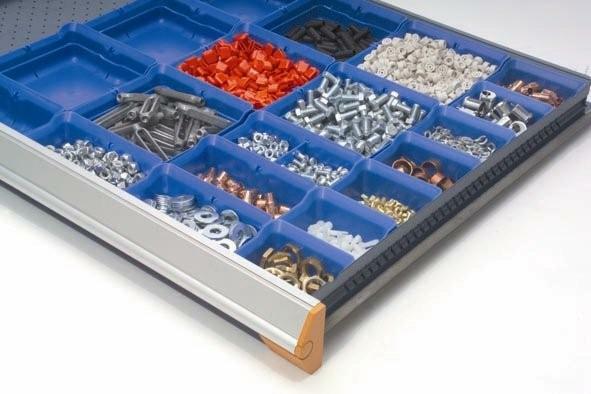 The advantage of the Rousseau modular drawer system is that they are manufactured in true North American dimensions and are compatible for installation in most standard shelving sizes. You can purchase drawer adapter brackets for over 30 brands of shelving that will allow you to install the drawers in your existing shelving units. This can save up you to 50% of the cost of new drawers in shelving units by integrating the used drawers with your existing shelving system. However, there are some downsides to looking at the used drawer storage option. 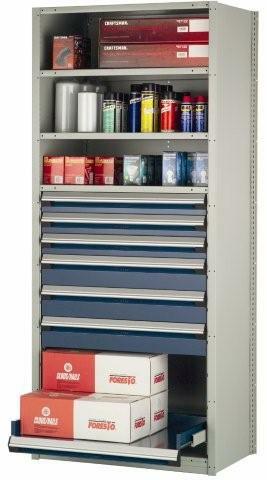 First and foremost, it is important to get a drawer system that is sized to fit your specific products. Most of the new drawer storage systems that are sold are designed with drawer sizes and heights to fit a specific storage application. It is not likely that you will find the exact sizes and quantities that will optimize your particular storage situation. A well-networked used equipment dealer may be able to locate the equipment you need, but it may have to come from other areas of the country where they happen to have more of that particular item. So, you may end up paying more for shipping charges than you anticipated. Or, since your exact specifications may not be immediately available in used equipment, you may need to be more flexible, and thus less efficient, than you would be with your preferred layout. You also need to be cautious with the age of the equipment. There is a lot of used equipment available that is very old, often from a company that has already upgraded to newer and more modern equipment. The drawers in question may already be worn and ready to be retired. Investing in equipment that is not in excellent condition may leave you with large repair and replacement costs going forward. There are many older models where parts are not even available. So, before you buy, contact the original equipment manufacturer of the product to make sure you can get replacements components for that specific system. You also need to be prepared for different payment terms than are customary for new equipment. Since used equipment dealers usually pay cash for the equipment they buy, they need to be paid sooner than a new dealer who receives terms from his suppliers. In conclusion, there are two key points that will help keep you safe when making a purchase of used modular drawer systems or components. The first and most important is to Know the Dealer. How long have they been in the Used Equipment business? Do they respond in a professional manner to your requests? What references can they give you in your field of business? Can they handle all the freight & installation details if required? The second is to Know the Equipment. The equipment should be available for inspection: in person, by video, mobile video conferencing, or with photographs of the equipment. Verify the age of the equipment (and the pictures). What would be the cost of comparable new equipment? You should have a quote for new equipment as a comparison, prior to the purchase of any used equipment. Check with the original equipment manufacturer to be sure that parts will be available (either used or new) for this equipment in the future. These are important considerations in any purchase you make for your company: Know your Dealer and Know the Equipment. 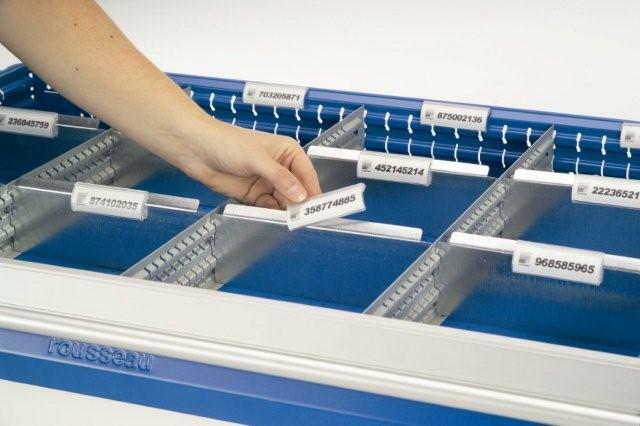 Replacing standard bin storage shelving with modular drawer cabinets or drawers in shelving units is one of the most effective ways to save space, increase speed and accuracy in order picking, and significantly reduce the time spent taking inventory. However, before you decide on a final layout, there are a few points to consider when designing your system that will make the change easier and ensure that your final layout will support growth and product changes in the future. If your order picking software can assign an inventory item to any available space in your storage system, then your issues going forward will be minimal. This type of system offers the most flexibility in what locations are assigned to a specific product. Smaller products can be stored in a location with other small products, maximizing the efficiency of the storage space. New products can be added at the end of the system in empty drawers provided for growth or be placed in slots vacated by older stock. This type of software and organization will make it easier to change product lines, add products, and remove discontinued or obsolete products. However, there are storage systems that can make the transition to drawer storage more difficult and create problems in the future. Let’s examine the typical concerns and see how these can be resolved with proper planning during the design phase. PROBLEM 1: Storing products in numerical sequence or grouped by vendor for ease in picking. This is probably the most typical storage system, but it is not the most space efficient layout. It is easy to locate a part moving down the aisle, counting part numbers as you go. However, this creates two main problems. First, you often have large items on a shelf, right next to smaller ones. This forces your shelf spacing to be higher and wastes space around all the small items because of one larger item. The second problem is when new items are added to the line that fall in the middle of a sequence of numbers. Now everything has to be moved ‘down one item’ to allow space for the new item. The reverse is true when an item is discontinued. You now have a gap in the system that is not used at all, wasting more space. 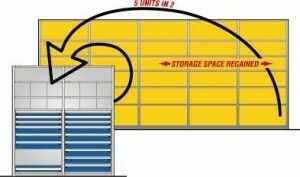 SOLUTIONS: Whenever possible, the most efficient storage is possible when you can store the same sized items together. It may be worth looking into a software system that allows you to reorganize your stock in this manner. If this is not an option, then modular drawers in shelving can provide a middle way solution. Installing drawers in shelving to fit smaller and then mid-sized products, larger products can be stored on the open shelves above and below the drawers. 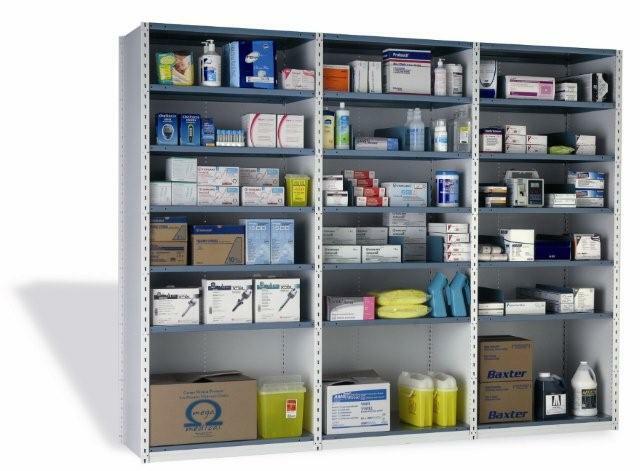 This allows you to keep part numbers in a ‘close to numerical’ sequence, with the full sequence being in a single shelving unit, but some of the larger items moved to the fixed shelves. This can increase storage efficiency significantly, so it can compensate for any difficulty in locating items that are slightly out of sequence. PROBLEM 2: Keeping a certain class of products separate from others for security or quality control. This is a common need in many stocking situations. There can be high value or dangerous products that may need to be locked up or secured in some way, separate from the regular inventoried items. Items that come in from a vendor may also need to be checked for quality or inspected before they can be put into the regular inventory. SOLUTIONS: In situations that require a higher control of product accessibility and distribution, there are a several security options available with modular drawer systems. With drawer cabinets, there will be a single key that locks all the drawers at once. This can limit access to those authorized to handle the products or items in that cabinet. Key systems for multiple users and multiple cabinet locations are available with a master keyed system to allow a supervisor access to all locations. Drawers in shelving can be locked with a vertical security bar attached to the shelving unit that can lock each bank of drawers. Both lock systems are available with keyed locks or are adaptable for padlocks. 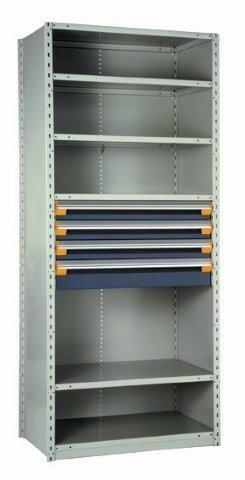 You can also have single drawers of a group, within a cabinet or in a shelving unit, which can be locked individually. These can be keyed differently from the cabinet or security bar, so that all the drawers in a group are accessible when unlocked, except for certain drawers that would require another key. The highest security would be with a modular drawer cabinet that has a true One-Drawer-at-a-Time mechanism. This would prevent two drawers from being opened at once. Locking doors are available that allow you to lock the entire contents of a standard shelving unit or a drawers-in-shelving unit. These doors come in solid steel or clear polycarbonate and are adaptable to any standard shelving, with or without drawers. PROBLEM 3: Expiration dated or time sensitive stock that needs to maintain a First-In First-Out rotation. Some products have a shelf life and need to be used or distributed within a certain amount of time. It is not acceptable to have older stock left in the back of a shelf that will eventually have to be discarded because it has passed its expiration date. Stock needs to be organized by date in a simple and clear way. SOLUTION: There are several ways that drawers can help with this issue. Product can be assigned to a specific ‘lane’ within a drawer. Each lane can have a movable divider that can be placed behind existing stock to indicate a batch or time sensitive lot. Newer product can be added to the drawer behind the divider and then the divider removed or product moved to the front of the divider after all the older stock is gone. In larger volume situations, two lanes could be assigned to a single product with a label showing the date code of each group. Older product is chosen first and then when that lane is empty, it becomes available for the next group of fresher product. PROBLEM 4: Varying inventory levels by a large amount to adjust for seasonal or cyclical requirements. Due to the seasonal nature of the need for some products, inventory levels can be very high at one time of the year and then drop to a minimum maintenance level for the rest of the year. When this happens with several items in your product line, it can create problems in storage and stock rotation. SOLUTION: Drawers in Shelving allows for dense and efficient storage in the drawers, while providing shelves above or below the drawer set to accommodate overstock of the same items. Color codes, tags, or a secondary label in the drawer labeling system can be used to indicate that there is overstock for a specific item and give the location of where to find the overstock. The dividers in the compartments can accept a variety of label widths and sizes to help with this type of system. PROBLEM 5: Your product line is growing and you will be continually adding new products. Growth is a good thing in most businesses, but can be difficult if the additional items added to your product line are not included in your planning. This usually leads to the disruption of your regular storage system and inefficient temporary storage options. 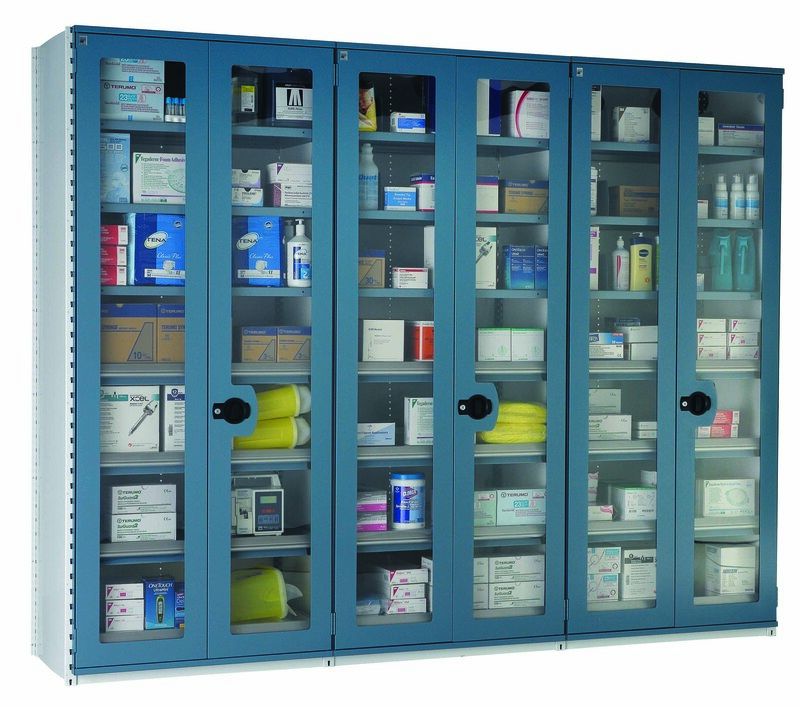 SOLUTIONS: You can factor in growth with modular drawers in a number of ways. For items that need to be grouped with other similar items, we can leave space in drawers to allow for the addition of new items in that group. 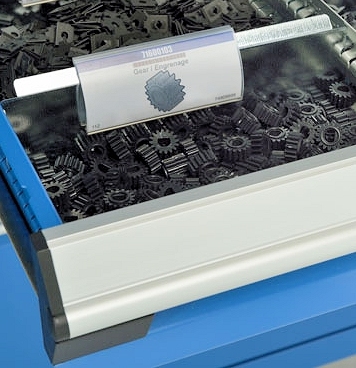 An analysis of your product mix will dictate how much space should be made available, but typically 20% of the space in a drawer can be reserved in high growth markets. 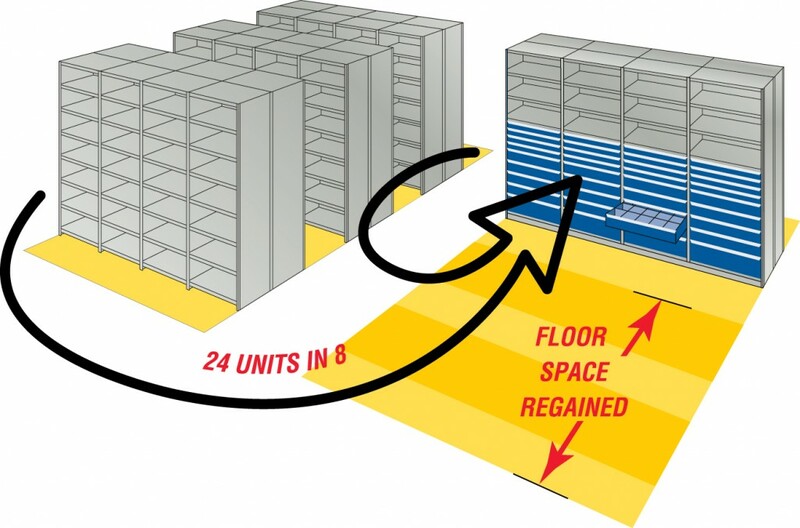 With the conversion of standard shelving to modular drawers in shelving, planning for growth is easier. Drawer sets can be added in groups from 18” to 48” high. So, typically you could start with 24” of drawers in a shelving unit (say, 5 or 6 drawers and add another 12” or 24” of drawers as the need for more high density storage arises. When converting to modular drawers, because of the efficiency of the drawer system, there will typically be empty shelving units left at the end of the process. These can be used for bulk storage or overstock and then converted to drawers in shelving when the existing system has reached its capacity. Click Here for more information on 5s organization. In this article we are going to go through the steps required to design the most efficient modular drawer storage cabinet for you application. By following these steps, you will maximize the storage capacity of your cabinet or drawers in shelving. Although we focus here on cabinets here, the same procedure would work for drawers installed in shelving units. We work with Rousseau Metal products that are made in North America. All Rousseau Modular Drawer Cabinets and Drawers-in-Shelving use Standard North American Dimensions and are compatible with most standard shelving brands and sizes. 1. Determine the Cabinet Height & type of Base. The standard base is a 2” high forklift-able base; raises the overall cabinet height by 2”. Optional 4” high base, accessible by pallet jack, raises the overall cabinet height by 4”. The cabinet can also be ordered without a base if vertical clearance is limited. The most common sizes are 36″ or 48” wide x 24″ deep, as these sizes will match standard North American shelving sizes. Another common size is 30” wide x 27” deep; a close match to some metric measured cabinets. 3. Determine the best Drawer Heights for your products. 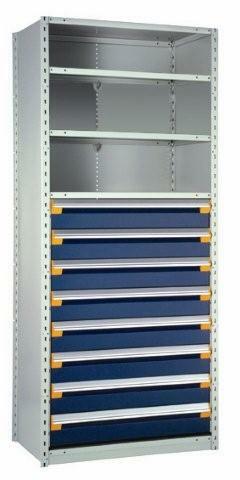 Available Drawer Face Heights: 3” to 10”, 12”, 14” and Pull-Out Flat Shelves (3” base height). All drawers have a 400# capacity with full extension, 100% of the drawer interior will be visible. The Usable Height inside each drawer is 1” LESS than the Face dimension of the drawer. The space available for drawers in a cabinet is 4” LESS than the Cabinet Height you chose. Therefore a 58” eye-level cabinet would have 54” of usable space for drawers, a 30” bench height cabinet will have 26” available. You can install any combination of drawer heights that makes up the available space, based on the face dimension of the drawers. Try to match the Usable Drawer Height, as closely as possible, to the products being stored. Usually this involves a full review of your products, including sizes and quantities of the items to be stored in the drawers. 4. Decide which (if any) Insert Options you want in each drawer. Internal Drawer Configurations can include Partitions (front to back, fixed) and Dividers (left to right, adjustable), removable Bin Cups designed to fit the drawer exactly, Groove Trays for long, thin items, PVC Drawer Liners, or Foam Inserts for protection or for tool cut-outs. You can have different layouts in each drawer. Drawer compartment layouts are specific to each drawer size. You can request a drawer compartment layout option sheet for the cabinet size you have chosen. For smaller fasteners and parts, we recommend bin cups in some of the 3” or 4” face drawers, rather than partitions and dividers, as they are easier to pick from and can be removed for use at a work station, or for ease in sorting or counting of parts. 5. You can call us, fax us, or email us with your specifications and we will provide free quotation within 24 hours. Want this information on a one-page PDF file?